Fiji Broadcasting Corporation’s 2Day FM Last Man Standing competition kicked off with 33 participants yesterday. FBC’s chief executive officer, Riyaz Sayed-Khaiyum, said the competition was Fiji’s first of its type. 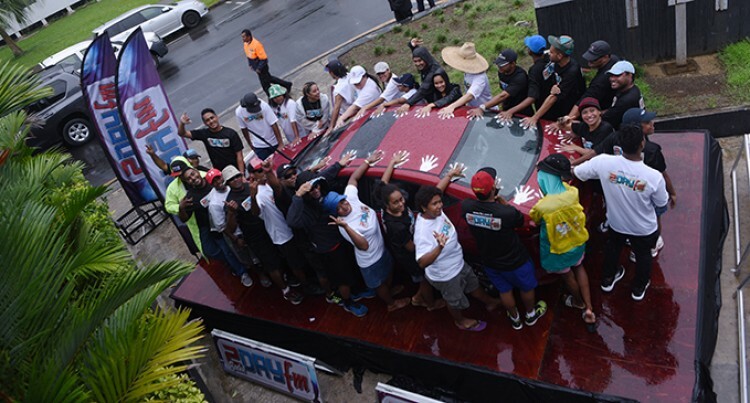 Fiji Broadcasting Corporation’s 2Day FM Last Man Standing competition kicked off with 33 participants yesterday. FBC’s chief executive officer, Riyaz Sayed-Khaiyum, said the competition was Fiji’s first of its type. He said the winner would drive away with a $59,000 car. He said the competition started on February 22 and went on for about seven weeks where the listeners had to call and answer questions over half an hour. “We wanted to do something to promote 2Day FM as the best young adult contemporary radio station in the country,” Mr Sayed-Khaiyum said. He said they went on with the competition for seven weeks to find the finalists. He acknowledged Carpenters Motors for offering FBC “such a wonderful car which is a Hyundai Elantra worth $59,000. “This is the first time ever in Fiji a competition like this has been held. “Usually, all competitions for radio are by text messages but this time we thought to be different,” Mr Sayed-Khaiyum said. He said they wanted to do a real interaction with 2Day FM and its listeners. “What we got today is what we have achieved and we are very pleased about it,” he said. “Some people called in several times a day to take part in the competition. “All participants have been cleared by their own personal doctors and provided with a medical certificate. The finalists are required to stand beside the car and place one hand on it. They are not allowed to move or take off their hand. But after every four hours they get a 15-minute break as directed by the organisers. During that break, they can eat, drink, go to the toilet, take a rest or nap. But when the buzzer goes they must immediately return to the car. Those who are late will be disqualified. Yesterday, four were disqualified. The competition will end when only one person remains standing. It could go on for several days, depending on the finalists’ fitness. Mr Sayed-Khaiyum said: “With the competition today, we will have a 2Day FM staff around the clock to monitor the finalists. “We will also have health personel available around the clock to keep checking the health of all the finalists as we want this competition to be fun and safe for all. “If the health officials find out that you may not be fit then they will stop you from the competition. “The competition is live on our Facebook page and details are on our website . “We always try to be a little bit different from all and do something to give back to the community. “And I’m sure this competition will go on for a few days because we have got some daredevil people in Fiji who can carry on,” Mr Sayed-Khaiyum said.